The discrimination begins, always, with the majority in a society pointing the finger at a minority for somehow endangering the public health and welfare. Individuals in the minority group are singled out as different - ethnically, biologically, spiritually, morally - from the majority. The human impulse to fear, judge, marginalize or eliminate those different from the rest has left a blood soaked trail winding throughout the entire history of man from the Great Inquisition to the Holocaust; from the killing fields of Cambodia to Rwanda, Serbia and Tibet; while the persecution of those with leprosy, TB, AIDS, mental illness, and handicaps continues in every society. It was with a heavy heart that I read the March 21 New York Times article, "Public Health Risk Seen as Parents Reject Vaccines." Then I waded through the venomous comments posted on the NY Times website attacking parents of vaccine injured autistic children and those supporting informed consent to vaccination, specifically legal exemptions. "I'm so tired of these morons who refuse to vaccinate their children. It's stupid and selfish and, as usual, the kid suffers because of an hysterical, paranoid mother. What we need is a vaccine against paranoid conspiracy theory nuts. Oh, yeah....and by all means, let's trust a primary care doc from Arizona rather than the AAP and CDC. After all, what does some pinhead in private practice know that the best trained, most informed academic docs at some backwater like Johns Hopkins or CHOP or Children's Boston know, anyhow." "The irrational decisions of adults, including parents and even physicians, supported by superstition, faith and magical beliefs, rather than data, evidence and proof, cannot stand in the way of science's obligation to create new knowledge to protect the members of a society, especially its most vulnerable members." "Western religion's relationship with God requires a scapegoat. Since the Satan bit is worn a little thin they have once again decided that science and technology are to blame for all man's evils. As a civilized society we have given far too much deference to religion. Those not wishing to participate should simply not be included in schools, hospitals, etc. Not allowing their children to participate is the cruelist of abuse and should be removed from their "care." "The parents whose personal beliefs cause them to fail to vaccinate their children should be seen clearly for what they are - child abusers. They are as monstrous as people that allow their children to die because they are convinced that if their god wants their children to live, he'll take care of it." "Science is not infallible but it works. No one doubts that savagely beating a kid and offering "religious beliefs" as a pretext is a crime. These parents are doing the same thing. They should be prosecuted for endangering the health of their children - and ours." "To those who demand an exemption, the choice should be clear and simple. No vaccine, no attendance at any public venue, schools in particular. Let these leaches live up in the woods as hermits." " Parents of immunized children should not allow their children to play with [unvaccinated children]. Being an outcast is a powerful tool to use against these very selfish people." "As an epidemiologist who believes in the power and strength of herd immunity, I would like to ask these people who forgo vaccination to politely leave the herd." "Those making this decision [to not vaccinate their children] should be ineligible for access to public schooling. They should also be mandated to inform any and all people with whom they come into contact of their lack of vaccinations. They should also sign a waiver to any public or insurance pool funding for treatment of avoidable disease and/or long term damage caused by contraction of that disease." "Should parents get to decide what happens to their child, even when that decision flies in the face of all evidence? Yes. But then should I have a right to know who these children are, so that I can keep my own child away from them? Indeed, I think I should......"
"They should not be permitted in clinics and hospitals, where immunocompromised children and adults have the right to safety. No exception, whether based on religious faith or just garden-variety ignorance and superstition." "This should be a reason to notify CPS so that they can remove these children from parents who endanger their lives. This should be a crime." "The parents who unilaterally decide to withhold immunization from their children should be sent to jail. The legislators who voted to condone this behavior should be identified and subjected to recall." .....Fine, so long as these parents are forcibly exposed to the illnesses themselves. And if their children either die, or are permanently injured, criminal charges should be laid. Then we'll see how much they still believe in their voodoo- science......"
Like sharks in a feeding frenzy, they gave public witness to their fear and loathing of fellow human beings who do not believe, think or act as they do. I could not help but think of the children and parents forced to line up last November at a Maryland County Courthouse patrolled by armed police with dogs, a stark reminder that the parents were under threat of imprisonment and fines for failing to show schools proof that their children got chicken pox and hepatitis B shots. I remembered the news report out of Belgium last month describing how a State court had sentenced mothers and fathers to five months in prison and a $4,000 fine because their children had not gotten vaccinated. And then I thought of the Jewish orphan from Philadelphia, whose DNA I inherited from several generations back, and whose lineage in my mid-west Protestant family was not known to me for many years. Her blood is my blood, her genes belong to me just as the Norwegian and Scottish-Irish genes that predispose me and my children to autoimmunity and vaccine reactions are part of who I am. I wondered how many of the readers of that New York Times article, who spewed fear, prejudice and hate into cyberspace and urged discrimination against and punishment of the unvaccinated, remembered that we are who we are because of the genetic strengths and vulnerabilities inherited from our mothers and fathers, grandmothers and grandfathers going back generations and generations. I come from a family of doctors and nurses, physical therapists and social workers, historians and soldiers, artists and writers, pastors and farmers, public administrators and builders; feminists and teachers, who have made the world a little better because they were allowed to live. And all through our family there is a history of autoimmunity, including rheumatoid arthritis, thyroid disease, diabetes, asthma, inflammatory bowel disease, severe allergies to foods, prescription drugs and pollen, and vaccine reactions. My mother died of lupus two years ago this week, her body unable to protect itself from self. A nurse who once took care of polio victims at Mayo Clinic, she left three children and 11 grandchildren, all of whom carry her genes. We do not choose the genes we inherit that make us the unique individuals we each are, as different from one another as we are similar within the human species. My mother would have gladly laid down her life for any one of her children or grandchildren in order to protect them from harm, as I and countless other mothers around the world would do. The biological imperative, which prompts mothers and fathers to willingly sacrifice their lives to ensure their children survive, dictates we do that in order to ensure the survival of the human race. For what is the human race but a collection of individuals from individual families living in different communities, all joined together to make up the whole of humanity? When any one life is devalued and deemed expendable, by extension, the well being and integrity of the whole is compromised. Individual health IS public health. Vaccine policies issued by the Centers for Disease Control (CDC) and the American Academy of Pediatrics (AAP) do not recognize the potential biological vulnerability of my family and many other families to be harmed by vaccination. It does not matter if we have a vaccine injured child: CDC and AAP policies turned into law by state legislators do not provide for vaccine injured children or the siblings of vaccine injured children to be medically exempt from vaccination. Children, who have had seizures and other health deterioration after vaccination, often do not qualify for medical exemptions. In the past quarter century, the numbers of vaccines the CDC and AAP insist that children must get has increased from 23 doses of 7 vaccines to 48 doses of 14 vaccines by age six without any large, credible studies proving it is safe for all children. How many of those genetically vulnerable to repeated atypical manipulation of the immune system through forced multiple vaccine use are among the highly vaccinated American children who are chronically ill and disabled today: 1 in 6 learning disabled; 1 in 9 asthmatic; 1 in 150 developing autism? The doctors in charge at the CDC and AAP have refused, for more than a quarter century, to acknowledge the existence of a growing number of vaccine injured children and so they have refused to identify and screen out children biologically vulnerable to vaccine-induced brain and immune system dysfunction. One-size-fits-all vaccine policies and state laws have become a de facto selection of the genetically vulnerable for sacrifice. It is a very small step from that kind of societal thinking to the prisons, concentration camps and killing fields that stand as chilling testimony to the human impulse to dehumanize others in order to control, exploit or eliminate them. Holocaust survivor Elie Weisel has said "When you take an idea or a concept and turn it into an abstraction, that opens the way to take human beings and turn them, also, into abstractions." In the face of a medical community committed to the utilitarian rationale that a minority of human beings can be sacrificed in service to the majority, the only way parents can protect children from being injured or killed by vaccines is by the free exercise of non- medical legal exemptions for deeply held religious or conscientious beliefs. Doctors inside and outside of government, who have instilled fear of and discrimination against parents with vaccine injured children, bear responsibility for the hate and prejudice expressed on the New York Times website last week. It is a wake-up call for all Americans who cherish freedom and the human right to make informed, voluntary medical decisions that involve a risk of injury or death. For more than 20 years, the National Vaccine Information Center (NVIC) has been receiving reports that adults,children and infants are suffering serious reactions to hepatitis B vaccine. Hepatitis B vaccine reaction reports began to come in to NVIC's Vaccine Reaction Registry in the late 1980's from adult health care workers, who reported extreme fatigue, muscle weakness, joint pain, loss of vision, memory loss, heart problems, and development of multiple sclerosis after hepatitis B vaccination. The people in China, who are facing cruel discrimination for testing positive for hepatitis B infection, are being persecuted because of myths and misinformation perpetuated by doctors pushing mass use of hepatitis B vaccine and pharmaceutical drugs. The hype that surrounded CDC-inspired mandatory hepatitis B vaccination laws in the late 1990's had doctors declaring to the media that hepatitis B is highly contagious and could be transmitted in school settings, even though they knew transmission was impossible unless there was a direct exchange of blood. When questioned in a public hearing in 1997, CDC official Eric Mast, M.D. admitted "although [the hepatitis B] virus is present in moderate concentrations in saliva, it's not transmitted commonly by casual contact." Aluminum in Vaccines: Dr. Palevsky Joins NVIC's "The Doctor's Corner"
In an article entitled "Aluminum Adjuvants: What Do We Know, What Don't We Know," pediatrician Lawrence Palevsky, M.D., FAAP, joins NVIC's new internet forum for pediatricians, "The Doctor's Corner" at www.nvic.org. Dr. Palevsky, who is co- founder and president of the Holistic Pediatric Association and past president of the American Holistic Medical Association, questions whether aluminum in vaccines is affecting the health of our children and contributing to the burden of chronic disease and disability. In his referenced article, Dr. Palevsky explains the importance of maintaining a healthy immune system capable of initiating and resolving inflammation in response to challenges from viruses and bacteria, as well as reviews what is known and not known about the effects of the heavy metal, aluminum, on immune and brain function. He asks "Does aluminum play a role in impairing the overall synergistic, balanced activity of TH1, TH2 and TH3, which is a requirement for a healthy immune system response to the natural environment?" Dr. Palevsky received his medical degree from the NYU School of Medicine in 1987. He completed a residency at Mount Sinai Hospital in NYC and a fellowship at Bellevue Hospital before joining Our Lady of Mercy Medical Center in the Bronx. He served as Chief of the Pediatric Acute Care Unit at Lenox Hill Hospital for four years and later was in private practice as a holistic integrative pediatrician for the Center for Health & Healing, an integrative and complementary care medical facility affiliated with Beth Israel Medical Center in New York City. He provides wellness care for families at the Northport Wellness Center in Long Island and in New York City and participates in community health education programs in New York and nationally. The Doctor's Corner, sponsored by the National Vaccine Information Center (NVIC), was created for enlightened pediatricians to publish referenced articles and stimulate dialogue about how and why vaccines cause reactions, injuries and death; why some individuals may be at higher risk than others for suffering a vaccine reaction; and ways in which vaccine risks may be reduced. The discussion on NVIC's The Doctor's Corner will also examine the relationship between infectious disease and vaccination and how early childhood experiences with both can influence immune and brain function. The National Vaccine Information Center has long supported the forging of a new and more enlightened partnership between pediatricians and parents when it comes to making vaccination decisions for children. Parents in the 21st Century are becoming educated about vaccination and they want something more from pediatricians than inflexible administration of one-size- fits-all vaccine policies that fail to respect bio-diversity or the informed consent ethic. Parents are looking for intelligent, open-minded, compassionate and courageous pediatricians offering an alternative to calls by physicians inside and outside of government issue for forced use of multiple vaccines by all children. The two pediatricians who have written articles for NVIC's "The Doctor's Corner" - Edward Yazbak, M.D. and Lawrence Palevsky, M.D. 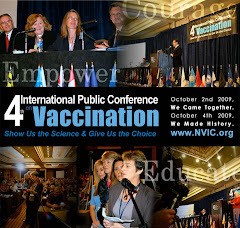 - demonstrate that there are enlightened pediatricians who respect and understand parental concerns about vaccines and the risks associated with inflexible vaccine policies. We thank them both for their courage and commitment to preventing vaccine injuries and deaths through public education. 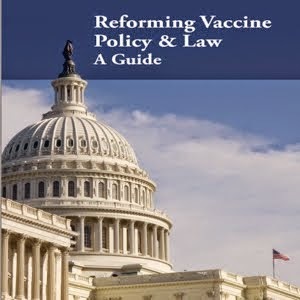 Ever since the historic National Childhood Vaccine Injury Act of 1986 was passed by Congress and signed into law by President Reagan, federal health officials at the U.S. Department of Health and Human Services (DHHS) have fought most vaccine injury claims in the U.S. Court of Claims. Even so, special masters in the Court have awarded nearly $2 billion to vaccine victims since 1988. Over the years, there have been several awards quietly made to children, whose autistic behaviors began after DPT vaccine induced brain inflammation, but those awards were vigorously protested by DHHS officials who insisted that vaccines do not cause autism. This week, however, the news is that DHHS officials have finally "conceded" that vaccines given in 2000 to a 19 month old girl with a pre-existing mitochondrial disorder did, in fact, cause brain inflammation that resulted in a spectrum of permanent brain dysfunction, including autistic behaviors. The child was given DTaP, HIB, MMR, Varicella and polio vaccines all at once and suffered classic vaccine reaction symptoms within 48 hours of the shots and subsequently regressed and was left with permanent disability, including autism. The parents of the child, Dr. and Mrs. Jon Poling, participated in a press conference in Atlanta today, which was broadcast on CNN. The Poling's attorney for the case was NVIC Board member Cliff Shoemaker, who has represented the vaccine injured in the federal vaccine injury compensation program (VICP) ever since it was created in 1986. Tonight the parents will appear on Larry King Live at 9 p.m. on CNN and there is an on-line poll on autism and vaccines on CNN's website. CNN's Dr. Sanjay Gupta explains what he thinks the VICP award means. The grassroots vaccine safety and freedom movement in America, which was launched by parents of DPT vaccine injured children in 1982, has been gaining public support during the past quarter century as the numbers of vaccines medical doctors force children to get has more than doubled. From New York and New Jersey to Missouri and Mississippi Americans young and old in big towns and small cities around the nation are joining together to talk about how to change the increasingly oppressive mandatory vaccination laws in their states so they can make informed, voluntary decisions about vaccination. It is no surprise that decades of collective denial and neglect by the medical community has led to a demand for fewer and more flexible vaccine laws. The calls jamming the phone lines and the emails and letters from desperate parents pouring into the National Vaccine Information Center have never been more alarming or heartbreaking than they are right now. Mothers describe how they took their child to a pediatrician or public health clinic for a scheduled well baby "check-up" or sick child visit and witnessed nurses and doctors injecting their child with 5 or 8 or 12 vaccines all at once, Then, they say, they watched their children regress into chronic poor health and disability. Many of the children have suffered previous vaccine reactions, which were ignored or dismissed as "a coincidence" by doctors insisting the children be re-vaccinated. Other children are sick and on antibiotics. Others have been born premature or have personal or family histories of severe allergies and autoimmune and neurological disorders. Over and over again, mothers describe in identical terms what they witnessed, their babies and children suffer following vaccination - seizures, high pitched screaming, collapse, unconsciousness, high fevers, body rashes, head banging, flapping, profound personality changes - cognitive and physical regression that changes the child physically, mentally and emotionally forever. And over and over again, mothers describe how their pediatricians stubbornly deny the vaccines just given had anything to do with what happened. As someone who has witnessed the proliferation of vaccines and vaccine laws devastate the health of three generations of children, there are no words to adequately describe the pain, despair and fear that has destroyed the once joyful time of young parenting in America today. Children and their parents have become unwilling victims of a medical- industrial complex driven by the profit motive and powered by an ideology that has a callous disregard for individual human life. It is no wonder that more and more Americans, young and old, are demanding the right to make informed, voluntary vaccination choices for themselves and their families. The grassroots vaccine safety and freedom movement in America is taking root in many states, particularly in those with the fewest exemptions and most vaccine mandates inflexibly implemented. The conscientious belief exemption to vaccination should be added to the religious exemption in every state and medical exemptions should be widened to provide enlightened physicians with the power to write exemptions for those who do and do not have medical conditions conforming to the narrow one-size-fits-all contraindication guidelines of the CDC and AAP. The right to informed consent to use of any pharmaceutical product or medical procedure, which carries a risk of injury or death, is a human right. Vaccination should be no exception. NVIC supports the efforts in every state to change vaccine laws to allow informed, voluntary vaccine decision-making. In Mississippi, parents will be meeting March 17, 2008 at 6 p.m. at the Flowood Public Library, 103 Winners Circle, Flowood, MS to talk about adding a conscientious belief exemption to Mississippi state laws, which only allow a medical exemption. Go to http://parents.meetup.com/465/ for more information. In the past few years, comprehensive reviews of influenza vaccine studies published in the medical literature revealed a stunning lack of scientific support for the safety and effectiveness of giving influenza vaccine to not only children but also to the elderly http://www.bmj.com/cgi/content/full/333/7574/912. The truth is that (1) only 20 percent of all respiratory flu-like illness in a normal flu season is, in fact influenza, and misdiagnosis often occurs; (2) the CDC has never provided published documentation that 36,000 Americans die from actual influenza every year versus respiratory illness that looks like influenza but is not; (3) there is little scientific evidence that influenza vaccine works or is safe for anyone; (4) government policies targeting all infants and children for annual flu vaccination may well endanger the long term health of this and future generations of children by atypically manipulating the immune system with repeated vaccination in an attempt to prevent all natural experience with type A or type B influzenza; and (5) these misguided flu vaccine policies could not only weaken the ability of future generations to experience and successfully heal from a bout with the flu without severe complications or death but also could put pressure on influenza viruses to mutate into more virulent, vaccine resistent forms that will cause future virulent epidemics in populations. The drug companies selling flu vaccine have one goal: making profit on the millions of doses of vaccine produced every year rather than throwing it away because of poor uptake. CDC officials, eager to help the drug companies out, keep issuing ever widening recommendations to qualify more Americans for getting a flu shot. What began as an effort decades ago to protect those over 65 from complications of influenza that can be deadly for the elderly, has become a boondoggle for drug companies selling and doctors making profit on administering influenza vaccine to everyone, including babies, children and adults. For the past four decades, every time the CDC has recommended a vaccine for "universal use" by children, those "recommendations" are translated into vaccine laws at the state level. Last year, New Jersey became the first state to mandate influenza vaccine for children as a requirement for attending school. Most states now require nearly three dozen doses vaccines that the CDC has "recommended." The majority of Americans may not want to get a flu shot every year but the time is soon approaching when they will have no choice. Strident calls by vaccine makers, administrators and policymakers for more vaccine mandates and societal punishments for refusing to comply (" No shots - no education, no health insurance, no job) are paving the way for the day when rolling up your sleeve for a flu shot will become as mandatory and punishable as drinking and driving. Increasingly, the CDC is guilty of endangering the public health, not protecting it. There is no excuse for issuing vaccine policies not supported by scientific data. The only recourse the public has is to change vaccine laws in the states to allow exemptions for conscientious and religious beliefs, as well as widen the medical exemption to allow enlightened doctors to exempt those with health conditions that are not acknowledged by the CDC as a reason for deferring vaccination. If vaccine laws cannot be made more flexible by allowing wider exemptions, then the day will come when the public will have no choice but to work for the repeal of all vaccine laws. The National Vaccine Information Center remains committed to working to insert vaccine safety and informed consent protections in vaccine laws in America.